A simple word, but one filled with profound meaning because while her act of defiance landed her in jail and caused her to lose her job as a seamstress in a local department store, it launched the now famous Montgomery Bus Boycott which was immortalized in the movie “Selma” and helped push Rev. Martin Luther King, Jr. to national prominence. 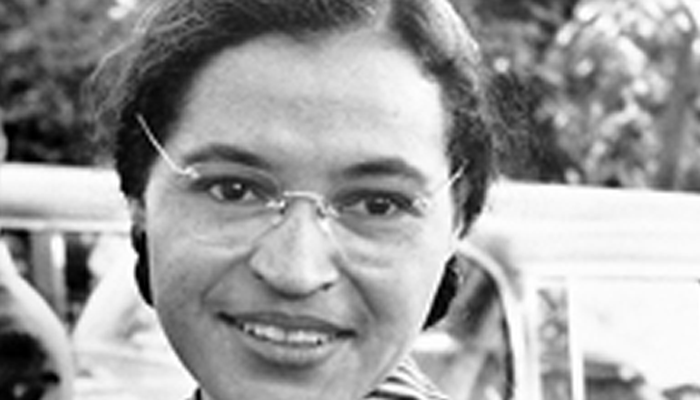 If we consider the context of place and time, Rosa Parks’ decision could not have been an easy one knowing it could land her in an Alabama jail during segregation when scores of blacks had been mistreated or even killed. “I have learned over the years that when one’s mind is made up, this diminishes fear; knowing what must be done does away with fear,” Parks said in response to questions over her fears. That same mindset is one that countless activists around the world have as they battle oppressive regimes with acts of defiance great and small; whether it was Malala Yousafzai, the youngest Nobel Laureate who was shot in the face by Taliban opposed to her activism for women’s rights and education, or Maryam Rajavi, a woman who leads one of the largest resistance groups to the Iran regime in the National Council of Resistance and whose members have been arrested, imprisoned, tortured and killed by the Iran’s religious courts. Parks quote is important because it clearly illustrates what often separates activists from the rest of us; the willingness to put oneself at risk knowing their actions might bring arrest or even worse upon them. Nowhere is that more true than in the Islamic state of Iran where the ruling mullahs enforce a brutal religious code that rules everything from civil life to economic matters to making war on its neighbors. Anyone offering up dissent is usually ticketed for a one-way trip to Evin Prison and often a nearby public square for a hanging. It is a barbaric system that many of risen up to oppose. Mrs. Rajavi’s group, including the PMOI/MEK groups, have led a long-suffering campaign to help get the word out on protests inside Iran past the Internet blockades, social media bans and confiscation of satellite dishes imposed by the mullahs. This includes recent mass protests by Kurds in the north, large protests over the teetering economy, and waves of protests by teachers sweeping across Iran over wages and working conditions all point to a deep level of disaffection and disenfranchisement by the Iranian people and their religious overlords. It’s worth remembering that the original Iranian revolution to overthrow the Shah was precipitated with a remarkably similar set of circumstances such as severe economic displacement among the people and a harsh crackdown by the government on dissenters which only grew as the protests grew. The same scenario is now happening in Iran. Given the steep declines in Iranian GDP over the past year because of the massive drains on the treasury in funding Assad in Syria to the tune of $35 billion and to keep Shiite militias in Iraq equipment and Houthi rebels in Yemen supplied has placed the Iranian economy on a precarious ledge. This Saturday in Paris, the global resistance to the Iran regime will be holding its annual gathering with a livestream available. We can only hope from that meeting of the thousands come a similar number of Rosa Parks whose simple acts of defiance can be the building blocks, brick by brick, of a new, democratic and free Iran.